Putting the Public Back into Broadcasters' "Public Interest Obligations"
On February 6, 2012, representatives of Sacramento Media Group (SMG), Media Action Center (MAC) and Occupy Sacramento, met with Clear Channel Sacramento (CCS) managers Jeff Holden and Alan Eisenson. 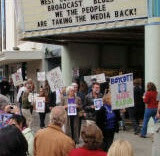 The meeting followed a December "Occupy Clear Channel" action, which was held in response to CCS’s recent switchover of their KFBK- FM 92.5 to a “simulcast” (rebroadcast) of KFBK-AM 1530, the station that launched and airs Rush Limbaugh and other conservative talk show hosts on a daily basis. With this change, Clear Channel now has three “talk” stations in Sacramento, all airing only programs with conservative political viewpoint in the key Monday-through-Friday timeslots. No alternate points of view are offered. What’s more, two of these stations transmit at very high power giving them a range of hundreds of miles. NOTE: We delayed publishing this report while we waited for CCS's promised response. Perhaps as no surprise, CCS declined to respond in writing. Each of us took a few minutes to explain who we represent, and what our interests in talk radio are. Sue Wilson described the Media Action Center (MAC) national efforts towards ensuring that broadcasters meet their obligation to serve “the public interest”. Ron Cooper presented an overview of SMG past activities with local television stations, including our meetings with station management and our evaluating of stations’ election coverage. He presented Clear Channel with copies of the SMG reports (4) documenting those efforts. These reports can be found at www.sacmediagroup.wordpress.com. Sue Wilson of MAC overviewed our ‘Statement & Suggestions’ document (Attachment A) generally outlining the complaints we have with the one-sided nature of Clear Channel’s political talk shows in Sacramento. An excerpt from that document, which captures the crux of our complaint, appears below. “Currently, Clear Channel's KFBK, in its key Monday-through-Friday timeslots, airs 50 hours of political talk radio which supports the "conservative" point of view. The simulcast of KFBK on 92.5 FM means another of our limited local frequencies is airing 50 hours every week of conservative political opinion on talk radio.) In addition, Clear Channel's KSTE airs an additional 90 hours of political talk, again reflecting only the "conservative" point of view. Our document had been made available to CCS prior to the meeting and contained the suggestions and questions we wanted to discuss with them. During our meeting, we offered that CCS could later provide written responses to our suggestions, for inclusion in this Report. They later declined our offer. Our “Statements & Suggestions” are outlined below, with a brief summary of the discussion that took place. CCS disputed these numbers, and challenged our “190 to 0” assessment, saying it was more like 50 hrs of conservative talk. They stated that they really want to create more balance, and that they had sought this with Bruce Maiman, who had an evening talk program for over 2 years, but it didn’t survive (i.e. didn’t get ratings). We noted that CCS’s recent conversion of their FM station (KGBY 92.5) to “talk” format and simply simulcasting the same old KFBK-AM programming did not seem to make business sense, since FM audiences are typically a younger demographic, and KFBK’s current talk shows (e.g., Rush Limbaugh, Tom Sullivan) have an older, largely male audience. We suggested that their FM station would be an excellent opportunity to offer “new blood” talk shows that would appeal to a younger demographic. CCS questioned why KSAC, a short lived “Air America” station, couldn’t make it with “progressive” programming. Sue countered with facts about the KSAC’s relatively low power (1000W), lack of capital and weak advertising sales structure, and noted that the station’s ratings were actually growing when it went finally off the air. The fact remains that CCS’s programming exclusively supports conservative politics. We questioned whether in an election year CCS management was comfortable with airing 9 hours / day (prime time) of one-sided political talk with no alternative viewpoint. They said they were. dedicate KGBY-FM to locally focused programs? CCS said they'd been trying to find suitable progressive programming, but were unable to find any. Our suggestions of highly rated talkers like Ed Schultz, Thom Hartmann and Stephanie Miller were quickly dismissed. on the air. We responded that these shows also have a conservative lean and that the host always has the most control over what the listener hears. So a few “opposition” callers allowed on the air are no match for a line up of solidly conservative hosts. suggested his time be expanded, but with guests, or using co-hosts on a rotating basis, in the interest of providing alternative viewpoints. management said they were fine with that, and defended their position saying they were very good at conservative radio, why would they change? They are clearly happy with their programming and do not care that it is politically one-sided and is not serving the broader public interest and needs of our democratic society. They also disputed our claim that about 50 million people nationwide listen to talk radio, saying it was more like 20 million. Our statistic comes from the annual report, “Arbitron Radio Today” (2009). We discussed our suggestion of reducing talk shows from 3 hrs to 2 hrs to make room for additional programs that would offer alternative viewpoint. They said that might be possible with some programs, but contractual issues are involved. They said that the Sean Hannity show has occasionally been pre-empted by other special local programs, but that Hannity, Savage, and Limbaugh are “here to stay”. We suggested shortening Limbaugh’s and Sullivan’s programs to create a 2-hr window for new “alternative viewpoint” programming. They did not appear open to this. They said their priority is ratings, and that their declining ratings (KFBK's ratings are roughly half what they were a few months ago) are due to the advent of Arbitron using “People Meters” for determining ratings. 4.) - include more "educational" talk shows that air multiple viewpoints on issues? They may do some of this as special programming closer to election time. Congressional, state legislative and local seats? They said that they plan on doing this, possibly preempting evening talk programs with debates hosted by local commentators. 6.) - clearly delineate which programs are "news" and which are "talk" / opinion? 7.) - offer fact-checking of statements made by talk radio hosts? 8.) - offer fact-checking of third-party campaign ads? CCS welcomed us to fact-check ads so they could remove any false ads. service announcements for their cause, like fundraising for the children's home. They invited SMG to participate in this group. 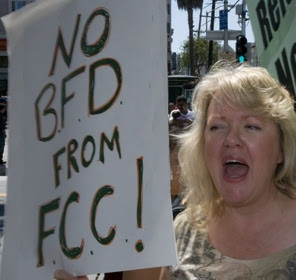 He also said that the California Association of Broadcasters (Stan Statham) actually does “community ascertainments”, which the FCC no longer requires a station to do. Since the meeting, we have received an invitation to participate in their Community Advisory Board. As mentioned above, CCS declined our request for their written response to our ‘Statement & Suggestions’ for inclusion in this report. Give alternative (non-conservative) talk programs equal time within their programming line-up. Air local talk programs with local hosts to provide a better balance with nationally syndicated talk programs. Perhaps expand their only current local talk show (John McGinnis) to 2 hours and include a co-host for alternative viewpoint. Establish a 2-hour maximum length for any talk show, thereby freeing up time for new alternative talk programs. Around election time, schedule on-air group discussion /debates of issues. Make a better effort to clearly delineate which programs are “News” and which are “Talk / Opinion”. Do fact-checking of third-party political ads prior to airing the ads. Make a better effort to obtain community feedback on the interests and needs of the listeners, and use this input to create appropriate responsive programming. A permanent ‘citizens’ advisory group’ would facilitate this. Radio stations licensed to use the publicly owned airwaves have an obligation to serve “the public interest”, not just the interest of certain political factions, or the interest of profit motivated owners. We feel that direct meetings of citizens with the management of radio stations are a worthwhile means for community groups to provide feedback on a station’s performance, and also to hear the station management’s point of view from the business perspective. We hope this type of face-to-face communication can help establish programming line-ups that offers talk shows with various political viewpoints and objective information so critical to a democratic society. It's also important to note that stations that refuse to air a balanced program line-up in response to listener demographics and feedback are in fact imposing a form of corporate or "private censorship" by depriving the public of objective information. In Red Lion Broadcasting v. FCC, the United States Supreme Court wrote: “The First Amendment does not protect private censorship by broadcasters who are licensed by the Government to use a scarce resource, which is denied to others.” The Court also answered the oft-repeated (on the air and now by the FCC) claim that any attempt to balance conservative views with any other political views violates the First Amendment. The Court again ruled on the side of the community, saying: "…the First Amendment is relevant to broadcasting, but it is the right of the viewer and listener, not the broadcaster, which is paramount." We agree that whoever is on a radio station microphone has the right to say what they wish, outside of inciting violence. But in effect, broadcasters who are willfully putting out a one-sided political message are stamping on the First Amendment rights of everyone else in the community, as they control who has access to the microphones, they are committing "private censorship." This is illegal, and we rely on the FCC to enforce the law, and listeners to demand better. Letter to send to the FCC here. Was the Sandy Hook School shooting faked by advocates of gun control? Were the people we saw crying over slain children actually actors? Were the kids themselves actors? Let's work together to put an end to this Fake News. The Federal Communications Commission has a rule against broadcast stations airing hoaxes unless they tell listeners in advance the show is fiction. But they will only act if persons living in Jones' listening areas send a complaint letter (not an email) to the FCC. Find out if you live in an area where Jones broadcasts by looking at the list at https://www.mediaactioncenter.net/2018/09/us-radio-stations-airing-alex-jones.html . Find a station in your general area, then click on "Coverage area" to see if you are inside the circle. Next, download the letter which meets the FCC guidelines for such complaints. It outlines specifically what Jones has said on the radio regarding the Sandy Hook shooting hoax and other dangerous hoaxes. Just print it out and fill in the necessary information. You will need to include your local station's call letters and Community of License, found in the list of Jones' stations on the left of this message. Please send the letter to the FCC (its mailing address is on the letter.) And please send a copy to the licensee of the station (that information is also on the Jones' stations list at the left of this message.) 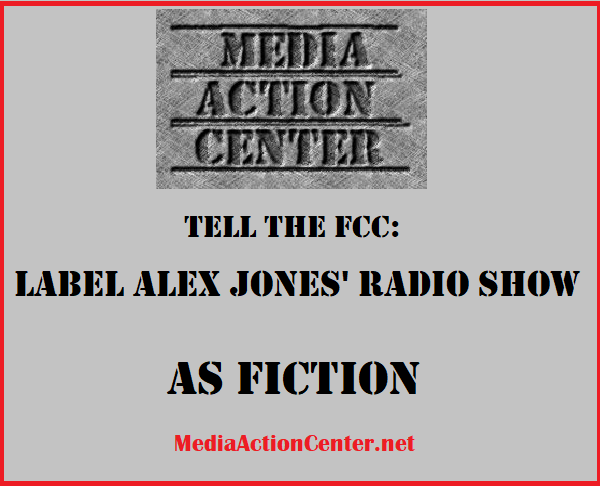 Also please email act@mediaactioncenter.net to let Media Action Center know you have sent a letter so we can monitor what happens, and potentially file license challenges if the FCC and stations refuse to act. It is a lot to ask people to send snail mail letters, but while big corporations get to email their information to the FCC, the agency requires We the People to mail a letter with a stamp. This is the only way we can get media justice. Questions? Email us at act@mediaactioncenter.net and we'll try to help. Thank you for being a part of restoring facts and truth to these United States of America. Please Donate to Support our Actions! Or simply purchase a DVD of Sue Wilson's film Broadcast Blues to share with your friends and family. In just 75 minutes, you will get a clear idea of what went wrong with today's media and how it adversely affected our society and led to Donald Trump. Watch and be inspired to make it right again! Here's where you can buy it. Thank you for helping us do what we do! SEE the MOVIE that SPARKED the MOVEMENT! Click here to Screen Broadcast Blues! From BROADCAST BLUES: Court Ruling: FOX News Does Not Have to Be True! THOUSANDS of sponsors of Limbaugh's show nationwide. This is not a boycott, but rather an educational campaign. Most advertisers bought ads for a group of six or seven radio stations in the same community, and were not aware their businesses were being advertised on Limbaugh's program. When StopRush politely educated them about what Rush was saying prior to their ads, most did not want their product affiliated with Limbaugh's comments and chose to stop advertising. Join them, and/or copy their model take away sponsors of hate and lies in your own hometown! VOLUNTEER to be Part of a Media Action Center Team! 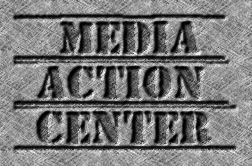 Media Action Center is the premiere U.S. media reform organization which provides you with information about how to reclaim your publicly owned broadcast airwaves. At the end of the day, real media reform takes real people putting boots on the ground, and that's what MAC does. Media Action Center is directed by journalist and activist Sue Wilson with the aid of volunteers from all over the United States. To join our team and get on our mailing list, send us an email: act@mediaactioncenter.net .